The tutorial explains the basics of Excel conditional formatting feature. You will learn how to create different formatting rules, how to do conditional formatting based on another cell, how to edit and copy your formatting rules in Excel 2007, 2010 2013, and 2016. Excel conditional formatting is a really powerful feature when it comes to applying different formats to data that meets certain conditions. It can help you highlight the most important information in your spreadsheets and identify variances of cells' values with a quick glance. At the same time, Conditional Formatting is often deemed as one of the most intricate and obscure Excel functions, especially by beginners. If you feel intimidated by this feature too, please don't! In fact, conditional formatting in Excel is very straightforward and easy to use, and you will make sure of this in just 5 minutes when you have finished reading this short tutorial. Where is conditional formatting in Excel? The same as usual cell formats, you use conditional formatting in Excel to format your data in different ways by changing cells' fill color, font color and border styles. The difference is that conditional formatting is more flexible, it allows you to format only the data that meets certain criteria, or conditions. You can apply conditional formatting to one or several cells, rows, columns or the entire table based on the cell contents or based on another cell's value. 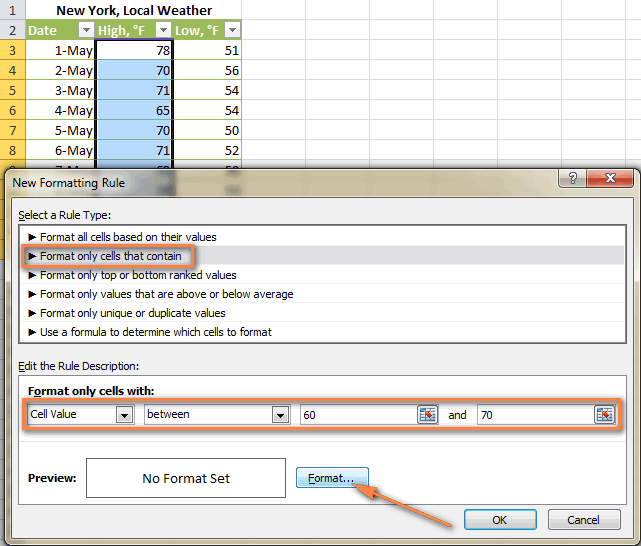 You do this by creating rules (conditions) where you define when and how the selected cells should be formatted. For a start, let's see where you can find the conditional formatting feature in different Excel versions. And the good news is that in all modern versions of Excel, conditional formatting resides in the same location, on the Home tab > Styles group. Now that you know where the conditional formatting feature is located in Excel, let's move on and see what format options you have and how you can create your own rules. To truly leverage the capabilities of conditional format in Excel, you have to learn how to create various rule types. This will help you make sense of whatever project you are currently working on. Which conditions should be met. I will show you how to apply conditional formatting in Excel 2010 because this seems to be the most popular version these days. However, the options are essentially the same in Excel 2007, 2013 and 2016, so you won't have any problems with following no matter which version is installed on your computer. In your Excel spreadsheet, select the cells you want to format. 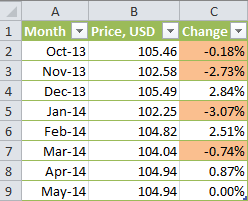 For this example, I've created a small table listing the monthly crude oil prices. What we want is to highlight every drop in price, i.e. all cells with negative numbers in the Change column, so we select the cells C2:C9. Go to the Home tab > Styles group and click Conditional Formatting. You will see a number of different formatting rules, including data bars, color scales and icon sets. Enter the value in box in the right-hand part of the window under "Format cells that are LESS THAN", in our case we type 0. As soon as you have entered the value, Microsoft Excel will highlight the cells in the selected range that meet your condition. Select the format you want from the drop-down list. You can choose one of the pre-defined formats or click Custom Format... to set up your own formatting. In the Format Cells window, switch between the Font, Border and Fill tabs to choose the font style, border style and background color, respectively. On the Font and Fill tabs, you will immediately see a preview of your custom format. When done, click the OK button at the bottom of the window. If you want more background or font colors than the standard palette provides, click the More Colors... button on the Fill or Font tab. If you want to apply a gradient background color, click the Fill Effects button on the Fill tab and choose the desired options. 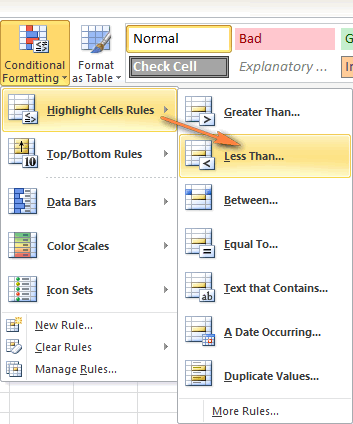 Click OK to close the "Less Than" window and check whether the conditional formatting is correctly applied to your data. As you can see in the screenshot below, our newly created conditional formatting rule works right - it shades all the cells with a negative price change. If none of the ready-to-use formatting rules meets your needs, you can create a new one from scratch. Select the cells to which you want to apply the conditional format and click Conditional Formatting > New Rule. The New Formatting Rule dialog opens and you select the needed rule type. For example, let's choose "Format only cells that contain" and opt to format the cell values between 60 and 70. Click the Format... button and set up your formatting exactly as we did in the previous example. Click OK twice to close the open windows and your conditional formatting is done! In both of the previous examples, we created the formatting rules by entering the numbers. However, in some cases it makes more sense to base your condition format on a certain cell's value. The advantage if this approach is that no matter how that cell's value changes in the future, your conditional formatting will adjust automatically and reflect the data change. For instance, let's use the "Oil price" example again, but this time highlight all the prices in column B that are greater than February's price. 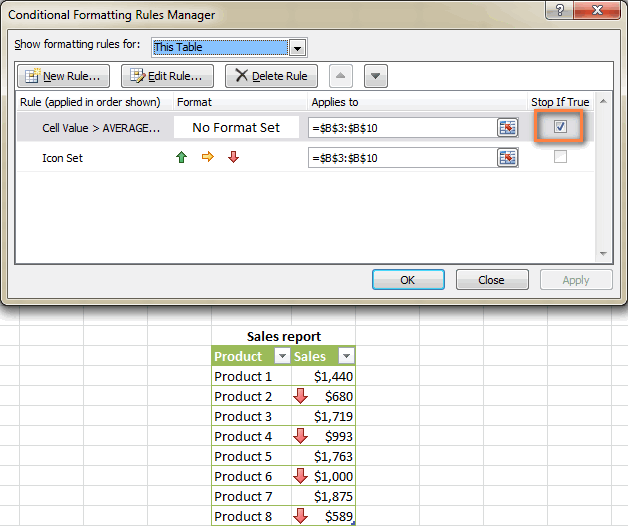 You create the rule in a similar fashion by selecting Conditional formatting > Highlight Cells Rules > Greater Than... But instead of typing a number in step 4, you select cell B6 by clicking the range selection icon as you usually do in Excel. As the result, the prices get formatted as you see in the screenshot below. This is the simplest example of Excel conditional formatting based on another cell. Other, more complex scenarios, may require the use of formulas. And you can find several examples of such formulas along with the step-by-step instructions in this article: How to change a cell color based another cell's value. 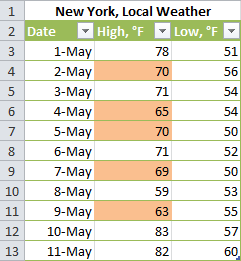 This is how you do conditional formatting in Excel. Hopefully, these very simple rules we have just created was helpful to understand the general approach. 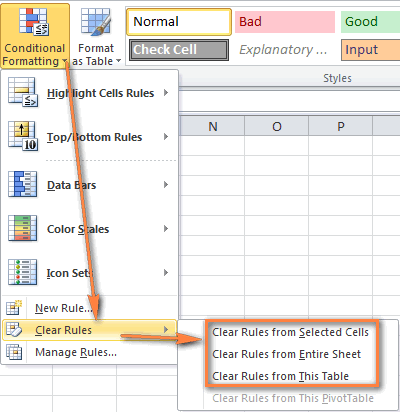 When using conditional formatting in Excel, you are not limited to only one rule per cell. You can apply as many rules as your project's logic requires. For example, let's create 3 rules for the weather table that will shade temperatures higher than 60 °F in yellow, higher than 70 °F in orange, and higher than 80 °F in red. 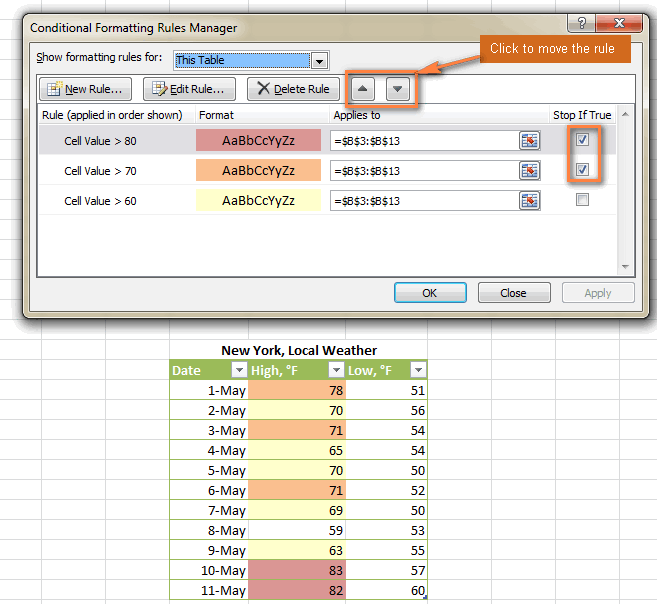 Click Conditional Formatting > Manage Rules... to bring up the Rules Manager. Click the rule that needs to be applied first to select it, and move it to the top using the upward arrow. Do the same for the second-in-priority rule. Select the Stop If True check box next to the first 2 rules because you do not want the other rules to be applied when the first condition is met. We have already used the Stop If True option in the example above to stop processing other rules when the first condition is met. That usage is very obvious and straightforward. Now let's consider two more examples where the use of the Stop If True function is not so obvious but also very helpful. Suppose, you have added the following icon set to your sales report. Create a new conditional formatting rule by clicking Conditional formatting > New Rule > Format only Cells that contain. Now you need to configure the rule in such a way that it gets applied only to the values greater than the average. You do this by using the =AVERAGE() formula, as shown in the screenshot below. Tip. You can always select a range of cells in Excel using the standard range selection icon or type the range inside the brackets manually. If you opt for the latter, remember to use absolute cell references with the $ sign. Click OK without setting any format. Suppose you created the "Between" rule to highlight cells' values between $0 and $1000, as you can see in the screenshot below. But the problem is that empty cells are also highlighted. 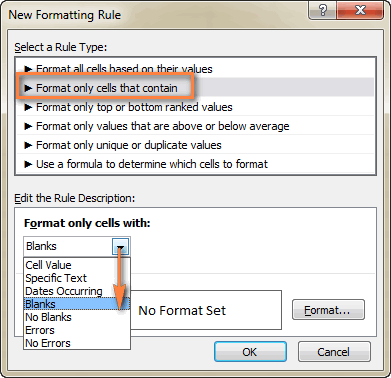 To fix this, you create one more rule of the "Format only cells that contain" type. In the New Formatting rule dialog, select Blanks from the drop-down list. And again, you simply click OK without setting any format. 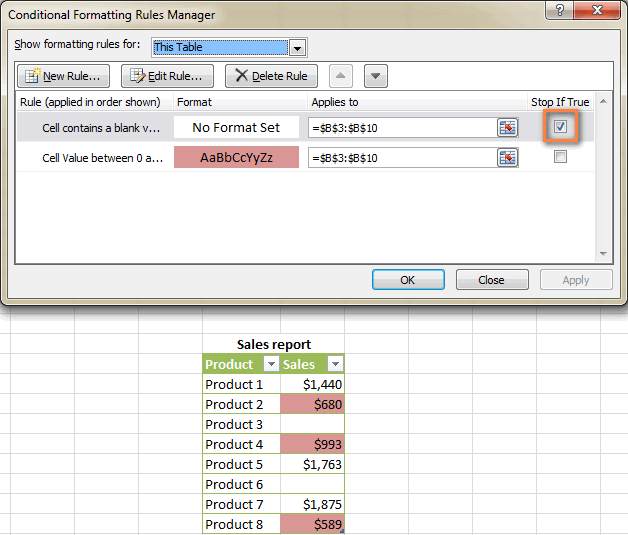 Finally, open the Conditional Formatting Rule Manager and select the Stop if true check box next to the "Blanks" rule. In the Conditional Manager Rules Manager dialog, click the rule you want to edit, and then click the Edit Rule... button. Make the required changes in the Edit Formatting Rule window and click OK to save the edits. The Edit Formatting Rule window looks very similar to the New Formatting Rule dialog you used when creating the rule, so you won't have any difficulties with it. Tip. If you don't see the rule you want to edit, select This Worksheet from the "Show formatting rules for" drop-down list to display the list of all rules in your worksheet. If you want to apply the conditional format you have created earlier to other data on your worksheet, you won't need to create the rule from scratch. 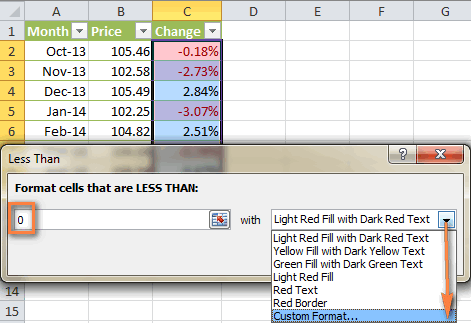 Simply use Format Painter to copy the existing conditional formatting to the new data set. Click any cell with the conditional formatting you want to copy. Click Home > Format Painter. This will change the mouse pointer to a paintbrush. Tip. You can double-click Format Painter if you want to paste the conditional formatting in several different ranges of cells. To paste the conditional formatting, click on the first cell and drag the paintbrush down to the last cell in the range you want to format. When done, press Esc to stop using the paintbrush. Note. 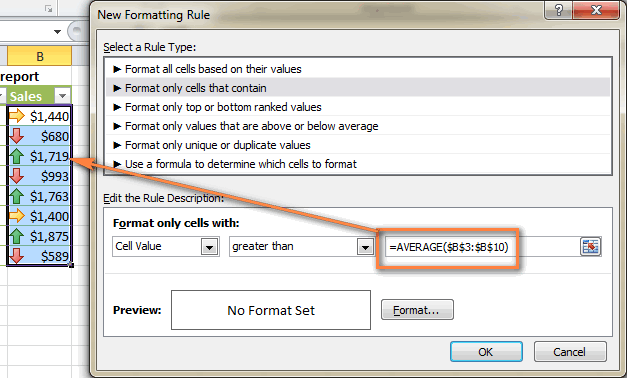 If you've created the conditional formatting rule using a formula, you may need to adjust cell references in the formula after copying the conditional format. Open the Conditional Manager Rules Manager (as you remember, you open it via Conditional Formatting > Manage Rules...), select the rule and click the Delete Rule button. Select the range of cells, click Conditional Formatting > Clear Rules and choose one of the available options. Now you have basic knowledge of Excel conditional format. In the next article, we will focus on more advanced features that will help you push conditional formatting in your spreadsheets far beyond its traditional uses. Excel Icon Sets, Data Bars and Color Scales - learn how to extend these conditional formats beyond their common uses, e.g. apply icons based on another cell's value. Excel formulas for conditional formatting based on another cell - the tutorial explains how to use Excel formulas to format individual cells and entire rows based on the values you specify or based on another cell's value. How to conditionally format dates in Excel - how to apply Excel conditional formatting to dates using built-in rules and formulas. How to change the row color based on a cell's value in Excel - see how you can quickly shade the entire row based on a numeric or text value of a single cell. Alternate row colors and column shading in Excel - the article explains how to alternate row and column shading in Excel using table styles (banded rows and columns) and conditional formatting. 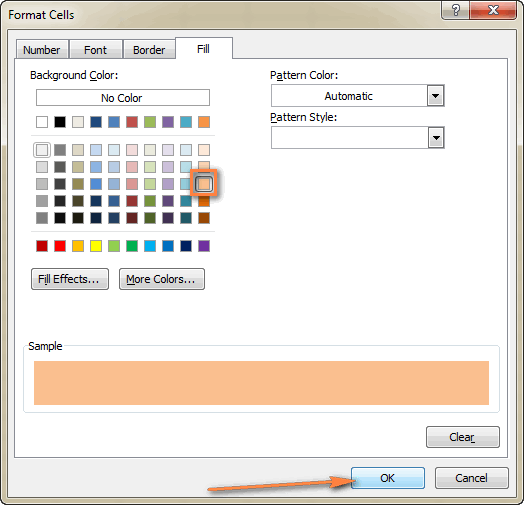 Change background color based on cell value - two quick ways to change the background color of cells based on their values in Excel 2013, 2010 and 2007. How to count and sum cells by color in Excel - see how you can count cells by color and get the sum of colored cells automatically. 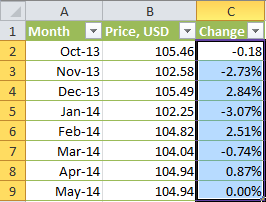 The solutions work both for cells colored manually and with conditional formatting. How to automatically highlight duplicates in Excel - the article explains how to use conditional formatting to highlight duplicates values. Conditional formatting in Excel PivotTables - this tutorial covers some of the differences in PivotTable formatting in Excel 2010. 247 Responses to "How to use conditional formatting in Excel 2010, 2013 and 2016"
How can I get the total in two cell's to reduce when I add an amount in another cell? For example cell H7 is at 100 and cells M7 and N7 are at 20. When I make cell H7 105 how can I automatically get cells M7 and N7 to reduce to 15? The cells are in hours and minutes. Could you tell me how to use conditional formatting to turn one cell yellow 5 minutes before to five minutes after the time "now()" listed in second or different cell? How to I highlight a column cell if the minute value is within 15 minutes of another column cell? C4 is only 11 minutes before F4 and needs to be highlighted. why my file cannot save the custom conditional formatting? I have around 30 rows where i have typed different dates. I want to highlight if the row date is less than today date with red font. Kindly help me how to do this. I want a cell to turn red base on a response in a combo box. The formatting works when it is in relation to any other cell or even a drop down list, but it seems as if it is not recognizing the combo box. that shows how many same digits in that page. with Bold & Colored. ? 1. I have 6 columns and more than 30 rows. 2. Column A contains dates in English & column B contains dates in local language. Here, I need a conditional formatting of cells from Column A through Column F if column C contains "Sat". This condition should apply even in blank cells where I need "cell fill color". Problem: I can fill color in the cell containing "Sat" but I need the same in entire row from column A up to F.
- Click on "New Rule" under Conditional Formatting and select the last option: "Use a formula to determine which cells to format"
I have a worksheet of inventory items. The first column is the stock number the second is the name of the items. The third one is how many we have received. The other columns are items that went to a project, we have approximately 13 projects and a formula for the last two columns which have what has been issued and what is available. The problem arises when my boss wants to lock the third column C which has the number of items purchased that has been sent to us. I have tried using the page protection function, but this locks the whole page not just the items in column C. I need the rest of the page to function while locking a single column. Is that possible and if so how do I do it? You can lock any range in your sheet, this feature is quite flexible in Excel. Please see detailed steps in this support article. I need to give me a reminder or change color of the vehicle ID colomn as soon as it reaches the oil change mileage. I have to develop a worksheet for oil change of fleet of vehicles. The oil change is based on current mileage to next mileage which is (Current Mileage + 7000). Would you help me out with this one. Could you please describe the structure of your table in more detail? Do you have columns with the IDs, current mileage, and mileage of the last time oil was changed? We'll do our best to assist you. I have list of codes in tab 1 (approx 100). I want to format the colum A in tab 2 that if I type the code other than mentioned in tab 1 than it should highlight. Will conditional format will work on this occasion? You can also compare the date with Duplicate Remover add-in to find unique values in your second sheet. Hello, I have a large spreadsheet with columns of data (example, K 39,041.00, L 34,584,.25, M 26, N 39,470.04)and would like to highlight cells in both column K & N if column N is greater than column K. I would like to do the same thing (different color) if column L is equal to column K. Can I accomplish this through Conditional Formatting? I am working on a spreadsheet which is to show delays in projects. I am using conditional formatting formulas to change the colour of the cell directly beneath the planned week number. Is there a way to copy this format so that the reference cells are automatically updated as they would be if a copying a normal formula? I want to implement alternating rows conditional formatting only if a field in Column A (A5:A500). Please help how I can achieve that? The formatting that I want to include is adding a border and filling the cell with a colour. Cheers. Is it possible to get copies of the workbooks you use in your conditional formatting articles so I can practice? I have a column with data in it with 3 rules set up. The rules are if the value is less than 80, highlight the cell in red, if the value is between 80 and 89, highlight in yellow and if the value is between 90 and 100, highlight the cell in green. Everything works as it should. I would like to know if it is possible to create another conditional format rule for all cells to the right of my column with values in it that will highlight the cells for each line of data to change color based on the data column? I only want to input values in the one column all the way to the left. The rest of the columns to the right only change color based on that column of cells. Used the formatting to fill colour in cells of varying "greater than" amounts relating to an average value which is based on a figure entered each week. So the names of people are down column A and each column after has their weekly score. Column AA has the average, which is coloured accordingly. I'd like to have the cell containing the name of each person to automatically fill with the same colour as the one containing their average score. Good day. Please assist me as i have to insert an IF formula for an evaluation tool. I have an overall average calculated for the tool however i require an IF formula that states if a certain criteria = 0 then the overall evaluation average should =0. I need to be able to register in two cells the highest and lowest negative and positive results from a changing portfolio total in order not to have to manually monitor and record these myself. I am a complete novice when it comes to formatting cells so a simple abc approach would be very much appreciated. Every time the results change, these formulas will adjust the highest and the lowest numbers. If you need to find the lowest AND the highest for negative results, the lowest AND highest for positive ones, let us know what Excel version you're currently using. Many thanks for your advice, much appreciated. I may not have explained the problem correctly. I have one cell with an ever-changing total, both post and neg, which I record in two other cells, one recording the highest positive and the other the highest negative. I would like to be able to record these automatically so need the formula for each cell to do that. Can someone please help me. I need to do conditional formatting on values that are on different worksheets.Cell O5 in worksheet A if it's found in Cell I in worksheet B to be highlighted as whatever colour. i want to learn how to make alert(thru highlight) when the stocks was below safe level. i was able to find out how for 1 row but my problem was how to do it if i'm monitoring 1 thousand items wherein i don't have to do it 1 by 1. 2nd, is it possible to highlight the entire row? =$C1< $B1 and it applies to =$A:$C. It will also highlight the raw if C is empty. If you want something other than that, please, specify. Also, here is a great tutorial on how to highlight an entire raw. How to Get? - If amongst 4 cells if I put 1 in any of the cells, rest of the three cell should be showing 0. How to do that? I am designing a hitmap using conditional formatting and I would like not to show the value in the cell. I have tried modifing the format of the cell by writting the comand ;;;; in the costum blog of the cell format... but does not work... any idea on how to "Hide" the cell value? I'm trying to make a timecard that calculates both regular and overtime hours. I want to make it where when I reach a total of 40 hours in regular time it stops entering data in the cells in the regular time column and any time over 40 hours will then start showing up in the cells in the overtime column. I want to see only one cell in which conditional formatting applied on the basis of value entered in the cell.That means if i enter 10% then 10% of the cell will coloured, if i enter 50% then 50% will be colored,if i will enter 100% then full cell will be coloured. (This is for only one cell). i have names lised in a column 1-15. What i am trying to do is is, that if one of those same names appears in another cell in the same column, that the original name in the column 1-15 disappears and turns a different colour? Is this possible through conditionl formatting? Hi Guys, Can someone help me please. i need help with an example below. in column y i want it to turn red if nothing is filled in a week after the dates in column x.
I've been trying to make this work. I want that every time I have a negative number in column L, the whole row where the number is change the font to red. I can make it work for just one row but when I try to implemented in the worksheet is when I got stuck. In the conditional formatting option I select the "Use a formula..." option. I type =$L:$L<0, But it doesn't work. when I just select a specific cell (i.e. =$L$145), it works but that's not what I am looking for. On the other part I just type the rows I want to be affected by this (=$A:$R,$T:$AD). Any help regarding this matter, I really appreciate it. How do I get excel to calculate the difference in dates in days? PL NOTE THAT A1 CELL HAS A VALUE "X", I WANT TO HIGH LIGHT CELL B1 WHEN IT'S VALUE LESS THAN 10% OF CELL A1. HOW CAN I DONE BY CONDITIONING FORMATTING FACILITY? I writing the figure 624 in a cell G6 and in cell H6 I writing =G6*1% in this case I got the correct answer, but I intend to get formula for multi figures in h6 like this =g6*1% with the new answer *10% and further with new answer *12% in just a single cell as H6. what I can do for the same. Guide me someone please. I have a table in which I already inserted formula & conditional formatting to get the result. Example:- In column O3 I have mentioned Expiry Dates & in column P3 I have mentioned =O3-TODAY() & inserted conditional formatting to know remaining days to get expired with Less than value using colour format. (Like, colour to be change as yellow if days remain less than 60 & Red if days remain less than 30) it is working. But What I want is if the expiry date has not mention in column O3 then Column P3 should be blank without anything. 1:- When I will enter date in shhet2 A2 column then the out put will show in sheet2 B2 column. My B2 column formula is =If(isblank(A2),"Please enter Date",if(isnumber(A2),vlookup(A2,Sheet1!A:C,2,0),"Invalid Date")). So I want, when will show "PLEASE ENTER DATE" in B2 then the font colour will be GREEN. When "INVALID DATE " will show then the font colour will be RED.And the result of vlookup font colour will show YELLOW. 2:- The second question is- I put the formula in B6 =if(A6="Sun","Ashok,Deepak",if(A6="Mon","Rajesh,Ramesh",if(A6="Tue","Prakash,Dillip",""))). So I want when the name will show then the font colour will be blue. so please tell me how to solve it by conditional formating. I'm sorry, but it's impossible to show the number AND the sum of numbers in a cell at the same time. But What I want is if the expiry date has not been mention in column O3 then Column P3 should be left blank without any text. It will remain empty if there's nothing in O3, otherwise calculate the date. Please read this article to learn why and when IF can be used. I'm trying to conditionally format cells ONLY if the cell does not contain a formula and the cells is >0. I have a data set that pulls data from different places and I want to be able to easily tell when something is hard coded as long as it's greater than zero. Perhaps someone might be able to help me. I'm an intermediate excel user but haven't extended much past simple formulas. I am working on a project with a column dedicated to using 3-4 single letters to represent different words. Is there a way to conditionally format so a blank column would automatically change the font color given the letter imputed into the cell? Im trying to add a conditions into a excel sheet to highlight the cell in chosen colour. if figure is cell A is equal to or more than 25% of the figure in Cell B, then colour cell A Red, otherwise colour cell A Green. I cant seem to work this out, I know its simple but my brain is fried. Sorry for disturbing you, but I am a newbie to Excel fomatting and need some help. I have an excel sheet where I keep the profiles of people(name, last name, performance, ....). I do have multiple copies of the same person(let's call him Andrey Goncharov) on my sheet as I am copying it from another source (every week). So last week I marked Andrey's "Performance" column as a "Top Performer". When I copy (from a different source) again this week, if there is Andrey Goncharov, I want Excel to auto-fill the "Performance" column of a new copy as a "Top Performer", because I already have done before for that person. I hope I could explain my issue. Thanks a lot for your help and support, you are a wonderful team :). I'm sorry, it's difficult to come up with any suggestion, since we don't know how your data is stored and there are too many peculiarities that can affect the way your task should be solved. If you still require our assistance, feel free to send us your example workbook with the source information and the result you want to get to support@ablebits.com. Please include the link to this comment into the email. Our technical specialist will take a look at your task and try to help. At work i have created a spreadsheet for all our new clients and all of the checks and ID they have top provide etc. before we can start working for them. When all of the checks have been passed and they have supplied sufficient information about themselves for our records the date of completion is put in the end column. How can I make this cell with the date in turn red after a year of the date? As this is when we have to request new up-to-date information from them... Any help would be greatly appreciated asap! I want to keep conditional formatting in dates for vehicles record. when i enter the current it should check last 6 month records. if it's there will change automatically. I am trying to create a training document. The document will contain several employees, each having a date they were certified, and then a date that they will be due to re-certify. I am trying to figure out the formulas that I would need to input in order to change the row either red=overdue, yellow=due within 90 days, and green=91days>. The formula that seems to be closest to what I need is Rule1=datedif($A2,Today(),"d")>=1:89,Rule2=datedif($A2,today(),"d")>=90:275, and Rule3=datedif($A2,today(),"d")>=276 but for some reason the rules are keeping all three colors from showing. could you please point me in the right direction and thank you for your time. I am trying to highlight number of cell with the number i keyin, what is the formula for this situation? I am not sure if it has been mention above but I am stuck with a formula. I want the following: If $X2 is not blank / empty and $W2 has a negative value (loss) then the entire row goes red. If $W2 has a positive value (revenue) then the entire row goes blue. I want to trigger a cell to change color depending on the % in another cell. I have been able to create rules for 0% in T8 to trigger U8 Grey, 80% T8 to trigger U8 orange, but when I add 100% T8 to trigger U8 Green it doesn't work and still triggers orange. Can you let me know what I am doing wrong? Thanks for any and all your help!!! I am trying to highlight cells in column C based on the second digit in a 10-digit code - I want each cell in that column highlighted one color if that digit is N, another color if that digit is not an N. I assume I will need two rules, and am trying to use the formulas =mid(c2,2,1)="N" and =mid(c2,2,1)"N". When I tested the formulas in a blank column the "true" and "false" come up correct, but when I put them into a Conditional Formatting rule, they are not highlighting the correct cells. Any suggestions? how do you compare figures that are in the same raw. e. g show how the deposits made perform against each other. Thank you very much for these tutorials, they are so useful!!!! Can someone help me with the below one ? A reports to B and B reports to C and c reports to D and so on hierarchy..
Now there are certain expectations wherein A reports directly to D .. in case I want to pull n represent this as per hierarchy how should I do it ? You've asked to apply four different conditional formats based on four different conditions, so you'll need four rules all applied to the same range of cells. Select the range of cells to which you want to apply the rules. Select Conditional Formatting, select Highlight Cell Rules, then More Rules, then select Use Formula to determine which cells to format. Notice that the formula references the top left cell in the range H48:H51. Your range and top left cell is probably different, but this formula must reference the top left cell in the range. Notice that this formula will apply the formatting to the date that is 75 days from today. The H48>TODAY() ensures the date in H48 is not in the past. You asked for TODAY()+ 180, etc. so the formula includes H48=(TODAY()+75), etc. So it is only formatting the cells that are equal to 180 days (or whatever number of days)from today. Not greater than the number of days from today. This allows you to put different formatting to each rule and specific future date. Select format, then choose the fill color then OK and then apply and OK your way back to the dialogue window that displays the rules. In that window you'll want to click Add New Rule so that you can enter a new rule which will have the same formula except that you'll change the "+" number to the different number of days and different formatting for each different rule. Follow this same procedure until you have all four rules and their respective formatting the way you want them. So I’m not sure what to use or what to do. So I’m trying to make an inventory sheet, so right now b9,c9, is 10 where e9,f9 is 10 and h9,i9 is 10. So when i9 goes to “0” I want h9 to Recognise and talk to f9 and say hey I’m giving my value of 10 to i9 so you will need to talk to e9 and Your Your 10 from him. Do I make sense? How is the cell you're entering the 20-2 formatted? Try formatting it in another way. Right click select Format Cells and then choose another option from that list. Maybe text. hi does anybody know how to make yes have a background value of 100%? So I am able link it to a dependent and can average everything out. Show the names of employees in blue text color who have salary greater than or equal to 3000 and show the names in green text color for those earning less than 3000. First place is 4, correct. Second Place is 2, correct, Third place is -2, wrong. It should be zero. I'm trying to format whole rows based on the data in column AB, using formula =$AB10>0 but it doesn't highlight anything. What am I doing wrong? The data in column AB is currency, and I need the rows highlighted if the value in AB is greater than $0.00. Hi experts, can you please tell me how to move the date on a plot(x axis)back to the bottom once I have changed to y axis to a logarithmic scale?